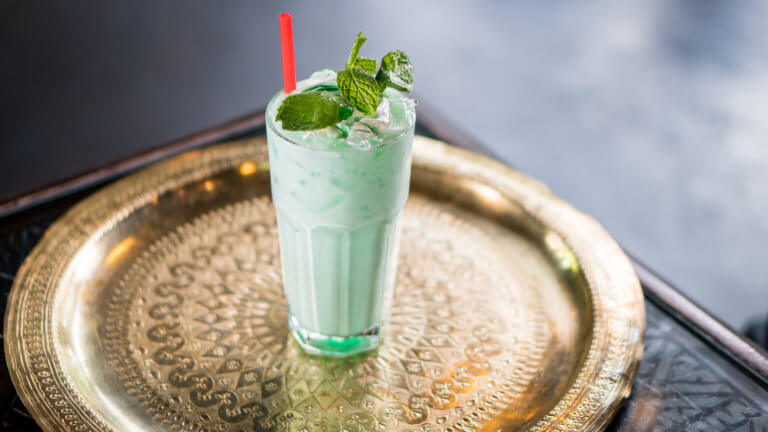 Dar Essalam - Wilsonville Food Delivery | WeDeliverEats | Use discount code 1STORDER to get your first delivery free! 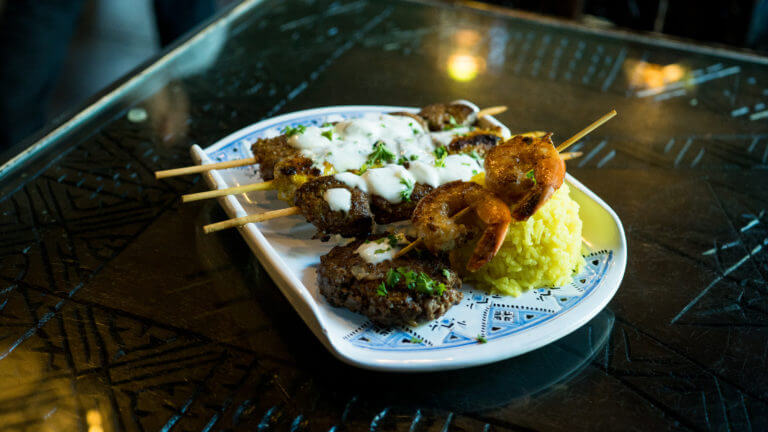 A platter of kabobs: chicken, lamb, beef steak, shrimp and a kefta patty (spiced ground beef) each uniquely marinated to enrich their own delicate flavors and grilled to perfection! 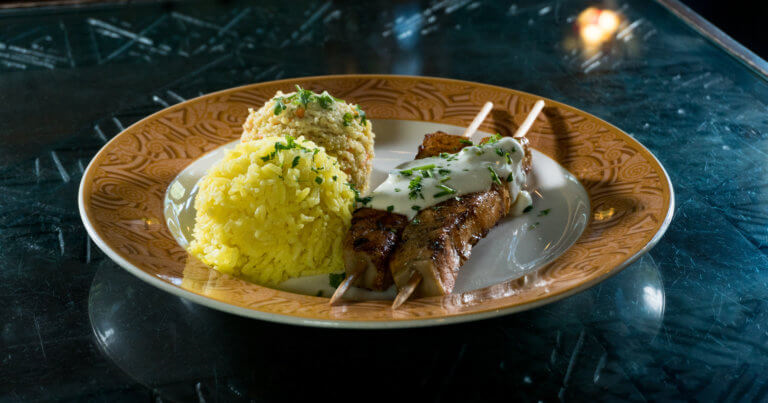 Served with saffron rice. 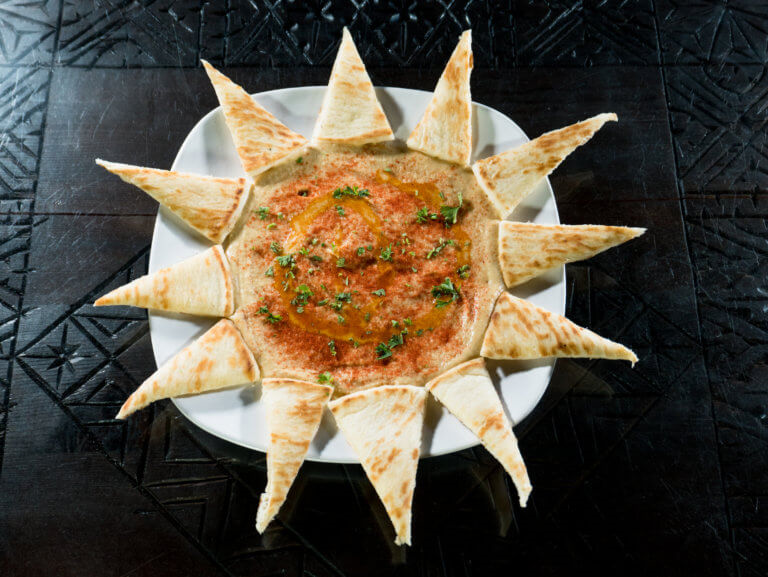 A generous serving of our signature hummus. 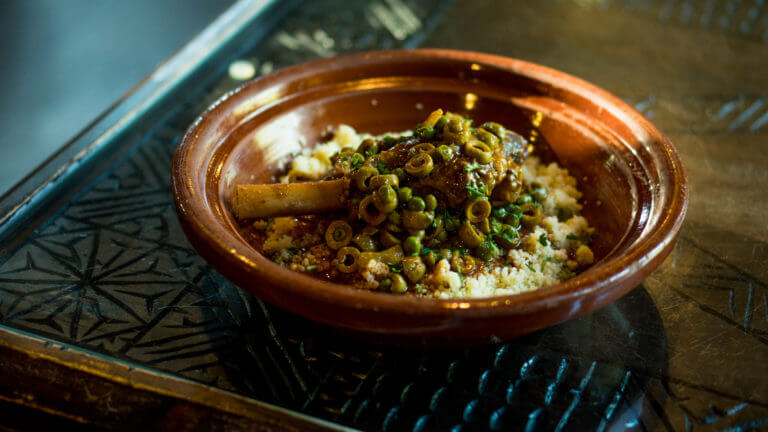 A Tajine is a slow simmered Moroccan offering that derives it's name from the earthenware pan and cone shaped lid it is cooked and served in. 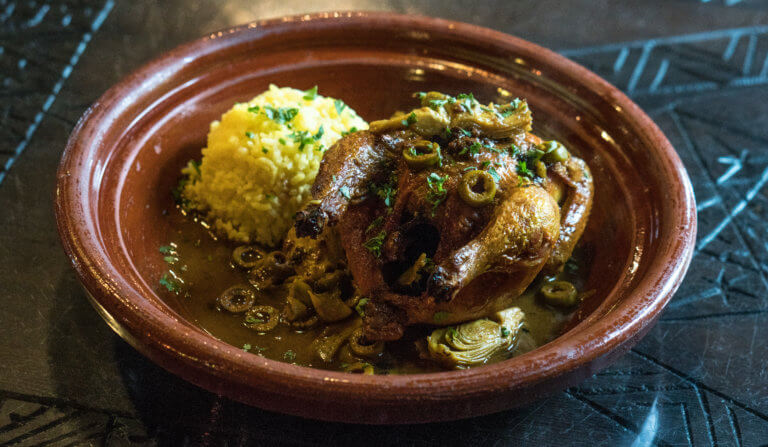 Tradtionally it is eaten with the thumb and first two fingers of the right hand with bread that is frequently dipped into the rich sauces of the tajine. 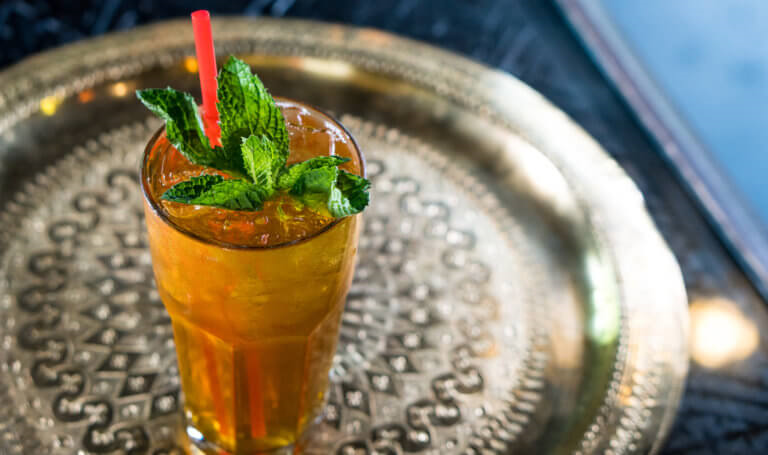 Bread is very important in Moroccan dining, both as food and also as an implement for grasping the hot food, then swirling in the flavorful sauce and then transporting it to the mouth. 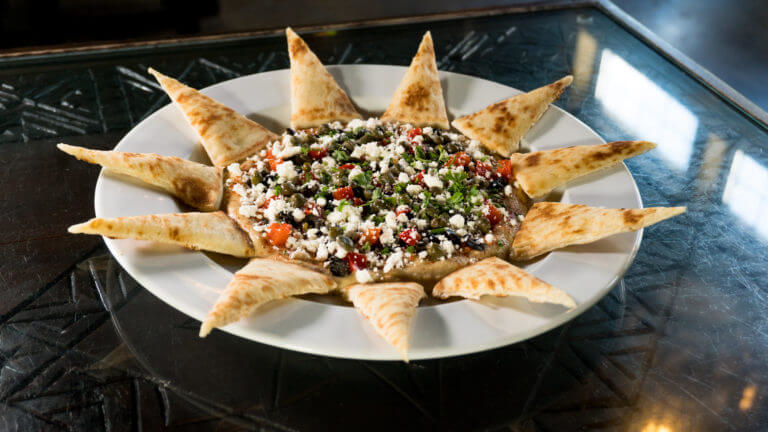 Our signature hummus topped with roasted red peppers, capers, feta and black olives with a drizzle of olive oil, surrounded by fresh baked pita. 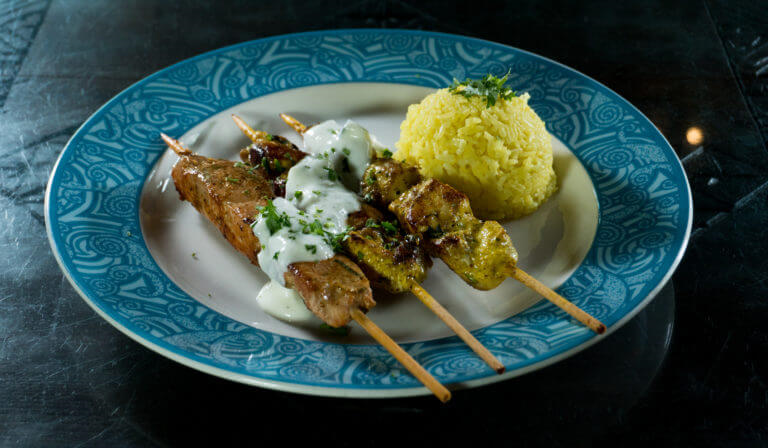 Moist chicken breast with lemon, saffron and garlic. 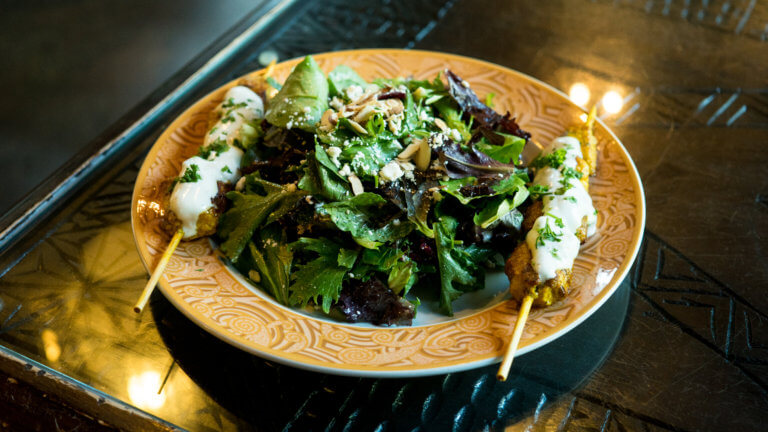 A pair of saffron chicken kabobs with a dollop of yogurt along side a salad of organic mixed greens, black olives, feta and cranberries with a pomegranate dressing topped with toasted almonds. Fresh spinach steamed and marinated with garlic, tomato, preserved lemon, green olives topped with melted-cheese. 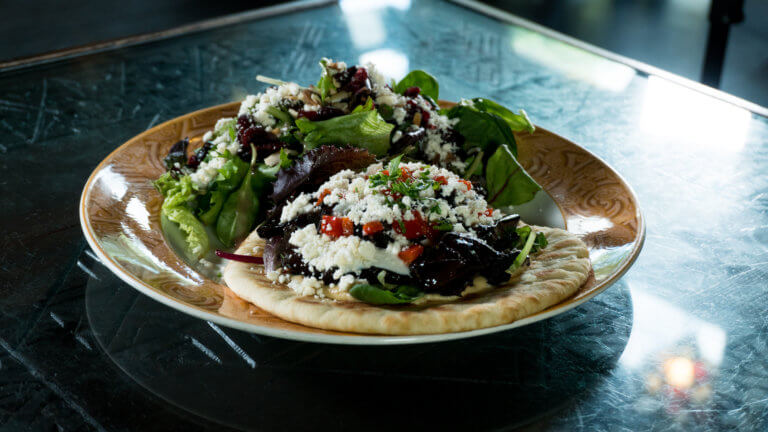 Served wtih fresh baked pita. 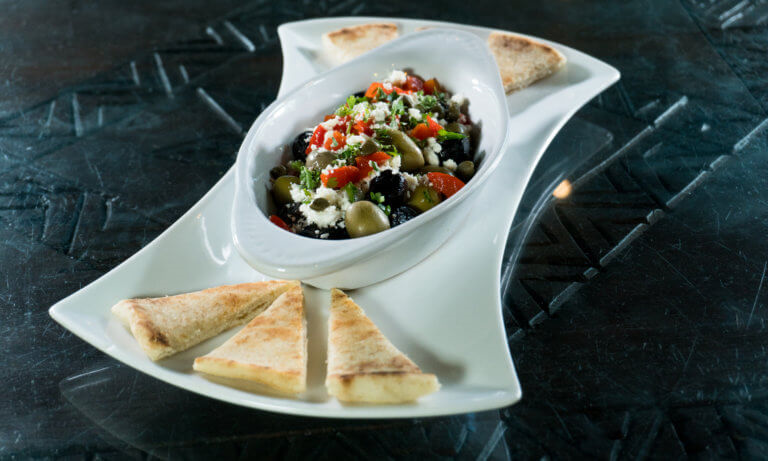 A Combination of bitter black oil cured olives and green olives topped with feta, roasted red peppers and capers. 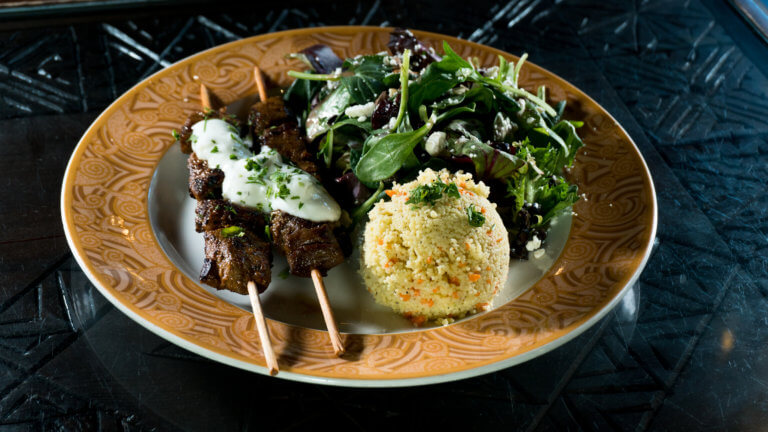 Tender lamb marinated with cumin, cilantro and garlic. Six jumbo shrimp with dill, cilantro and garlic. Grilled eggplant with humus snuggled in a pita. 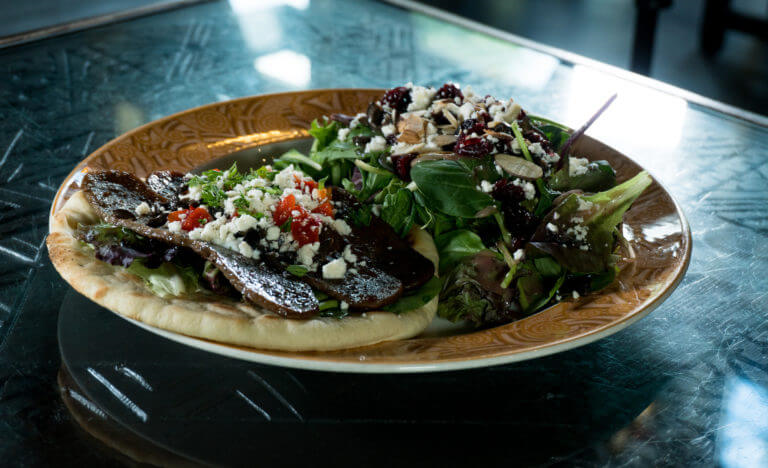 Our signature gyro - the BEST! 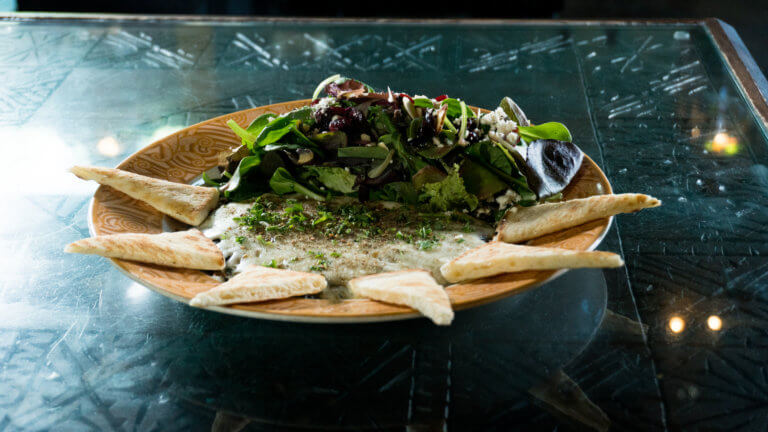 Warm marinated spinach with melted cheese and choice of side. 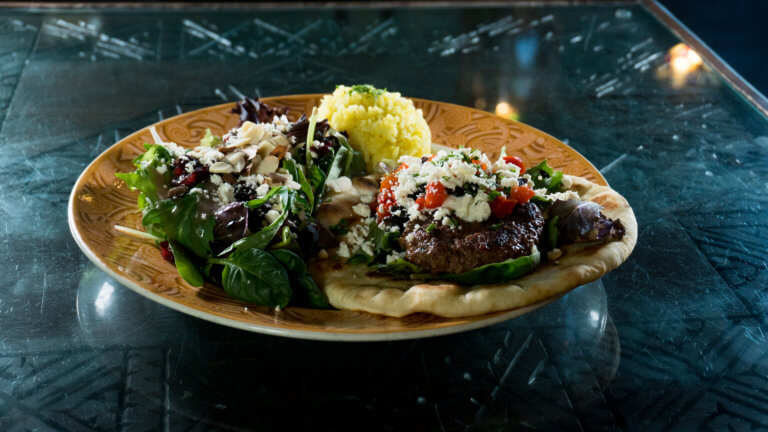 Ask for a fresh backed pita under your kabobs to make your own sandwich. A festive dish of chicken, saffron, custard and toasted almonds snuggled in a crisp buttery filo pastry. 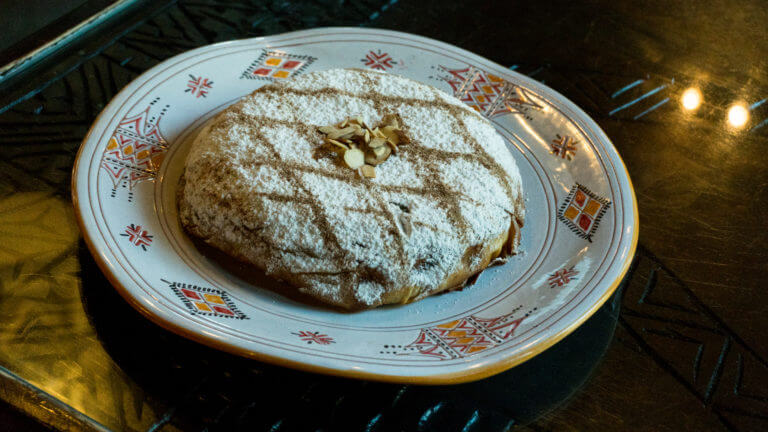 Bastilla's are always served with a light dusting of powdered sugar and decorated free hand with cinnamon. 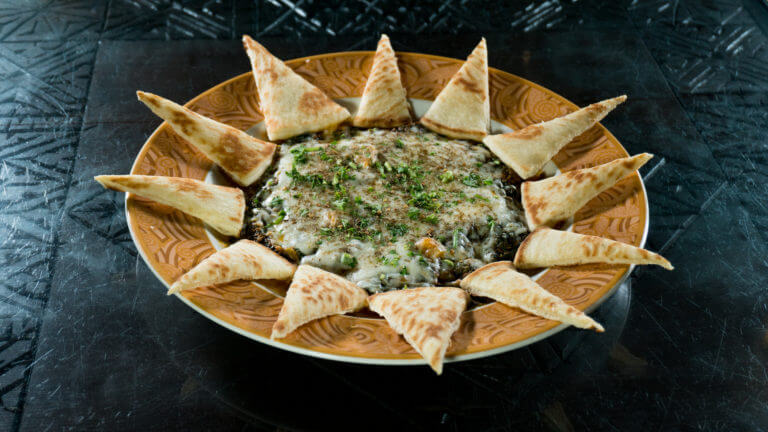 This Moroccan pastry is served at weddings and as a first course to guests of honor. 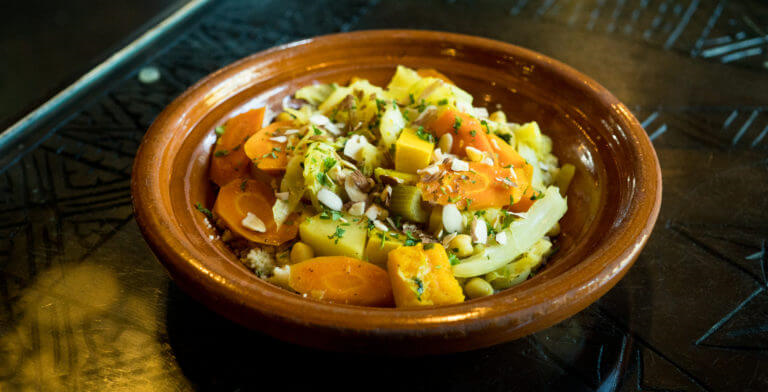 Turnips, parsnips, carrots, squash, celery, cabbage and garbanzo beans in a ginger-garlic saffron sauce piled high on steaming couscous sprinkled with toasted almonds. 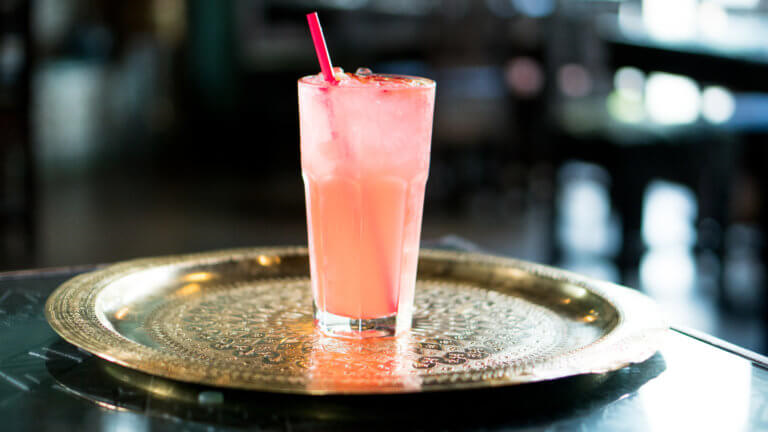 Request it spicy - fabulous! 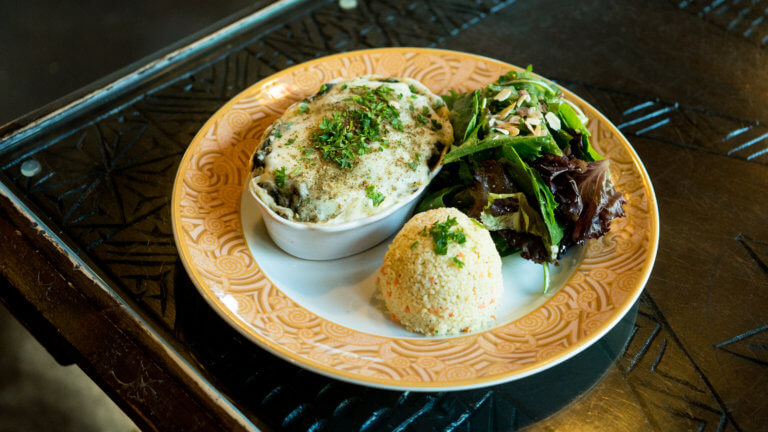 Fresh spinach, steamed and marinated with green olives, preserved lemon, tomato and Moroccan spices atop saffrron rice with cheese. 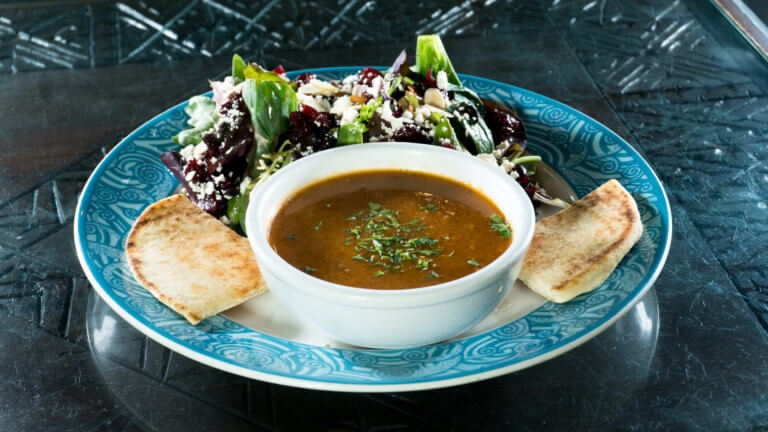 Served warm with a chilled couscous salad and house salad with pomegranate dressing. 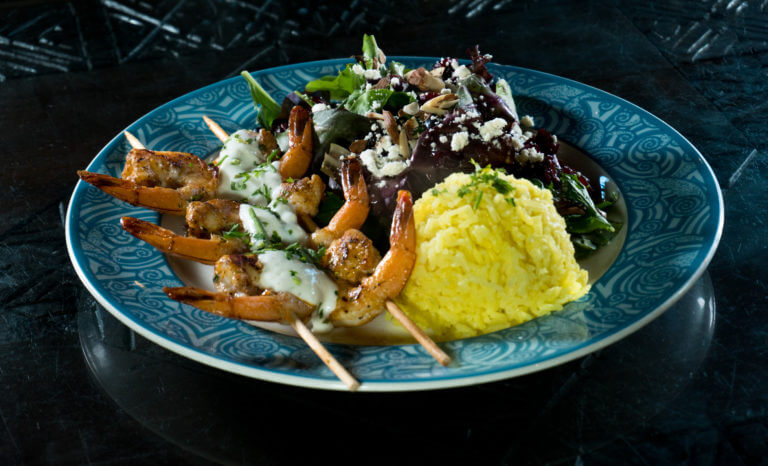 A Pair of salmon kabobs and three jumbo shrimp served with our house salad and saffron rice. 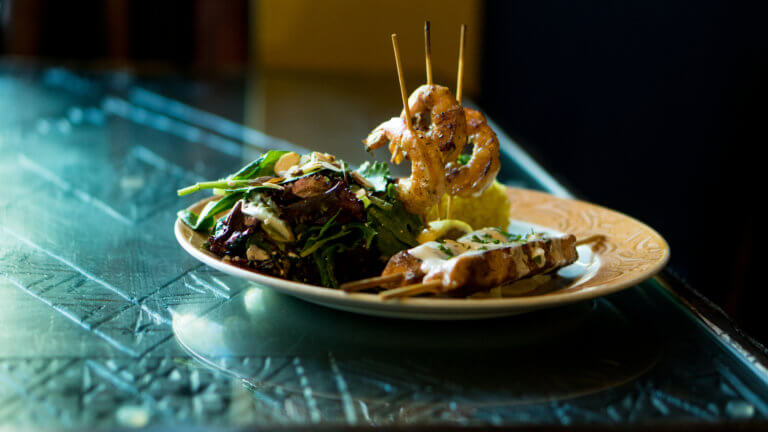 A seafood lover's dish! Dar Essalam's own specialty of buttery filo layered with almonds and smothered in orange blossom syrup, served with vanilla ice cream and a cinnamon drizzle. A crisp filo triangle stuffed full of rich dark chocolate, toasted coconut, almonds and walnuts, served warm paired with vanila ice cream. A filo "pie" stuffed with peaches, pears, bananas, strawberries and apricots. Lightly dusted with powdered sugar, almonds and topped with a generous dip of vanilla ice cream, served right from the over. 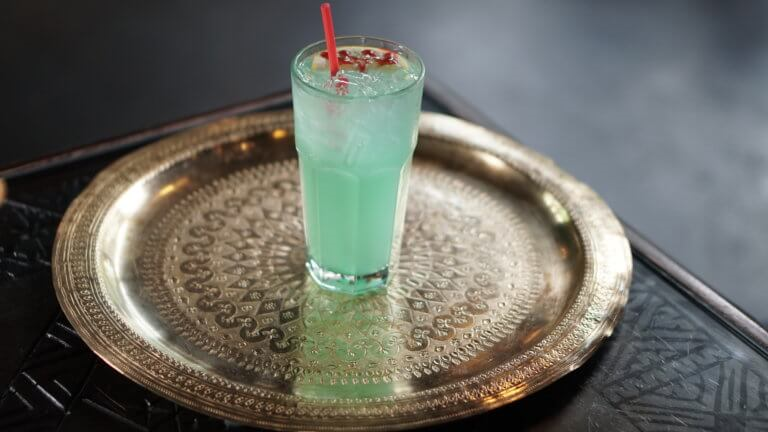 BIG enough for sharing with friends. Takes 20 minutes to make and bake.